Cholesterol and Heart disease do medications work? When you are told something: Is it true? Is it useful? Does it help? 1908 was the first time diet was linked to atherosclerosis( cholesterol deposition and hardening of the arteries). Since then there have been several nutritional studies that connected animal fat and protein to plaques in animal blood vessels. This was refuted in other studies and then came the game changer. In 1940’s the cholesterol pathway was discovered and this led to a number of studies. Initially, it was diet changes that were instituted as an intervention to reduce this and then it was hormones including estrogen and thyroxine. The hormone treatment caused more deaths. Then medications like niacin, gemfibrozil worked only partially and had some side effects that they got phased out. With the discovery of the enzyme, HMG co reductase and the action of statin in the 1970’s had made this medication the magic pill that reduced previously difficult to control cholesterol. The initial statin was from fungal sources and this evolved to complete synthetics. The discovery PCSK9( proprotein convertase subtilisin/kexin 9, which degrades the receptor (or the receiver) of the “lousy” cholesterol, that puts it back into the liver, thereby increasing the levels of the LDL in the blood, gave birth to yet another new drug. A medication to inhibit this(PCSK9)has been another promising weapon against this pesky sticky cholesterol issue. Where is Heart disease now? So did the advent of the variety of cholesterol-lowering medication lower our problems with heart disease? Today heart disease from atherosclerosis is the leading cause of death. So what good have these cholesterol medications really done? They have significantly reduced the cholesterol by 10% ( though initially thought to be by 30%)however heart disease continues to be a leading cause of death in this country and the rest of the world. Several studies came out with the results of the impact on 75 years old and older that low cholesterol was associated with increased risk of cancers, stroke and heart failure. Further the side effects of the cholesterol-lowering medications including muscle pain, it’s interaction with other medications made it the most common drug to be removed when an older patient is on multiple medications. When there is confusion there is only one direction to go: nowhere and no change. The impact of cholesterol medication on memory was also noted so much so that there is a black box warning on 80mg of atorvastatin. So why is there so much confusion? Many different diseases have one underlying cause and many causes can be responsible for one underlying disease. This all stems from one issue: we never address the true cause of high cholesterol. Cholesterol is made in the liver: about 800 mg a day as the body needs this for replacing cell walls that need to be replaced. It is the raw material for hormones and several other functions in the body. When there is cholesterol that comes from the diet the liver adjusts its production. In the standard American diet, the amount of fat consumed is about 50 to 100 grams of fat. This fat is disposed of in 8 hours. With the increased intake of food and increased frequency, it is 24 hours before the fat leaves the blood vessels. The recommended intake of cholesterol is about 200 milligrams a day. It is important to understand cholesterol and saturated fats are not synonymous. Most meats and animal proteins have cholesterol and not all of them have saturated fats. Plant-based fats have no cholesterol but something like coconut has saturated fats. 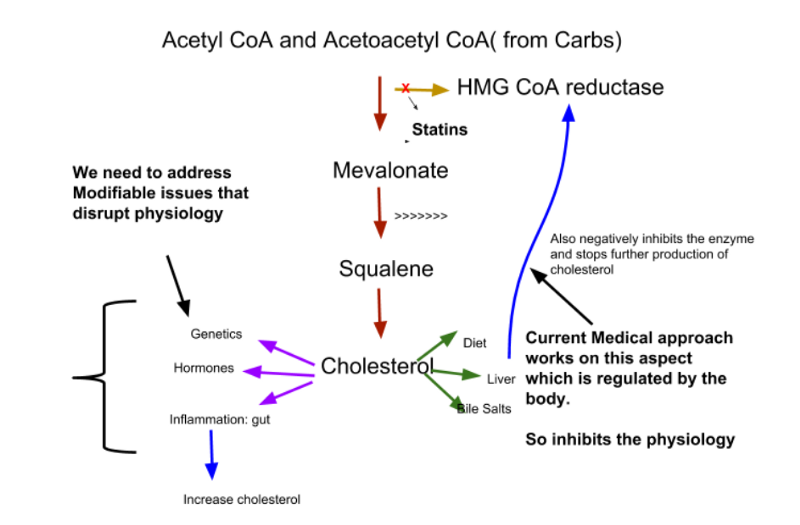 So what should we be looking for before we treat cholesterol with medications? This requires an article on its own. Some folks are more prone to have higher cholesterol levels when taking in high saturated diet. Apolipoprotein E and Lp(a) protein [genetic cement]tests have to be checked. If positive they are better off with a strong plant-based diet. It is best to work with someone who has done integrative nutrition or be guided by a practice that does functional medicine for vascular health. Insulin is the hormone that is produced when someone eats. It comes from the pancreas and its job amongst other things is to maintain optimal blood glucose levels. When cells resist this action of insulin which is by a very complex mechanism but mostly due to intramyocellular fat or fat in muscle cells, then there is disruption of the cholesterol levels. This hormone functions to reduce blood sugars and it also acts as a growth factor. It inhibits the enzyme that breaks down the fat absorbed from the food, (called chylomicrons)leading to increased triglycerides and this can lead to atherosclerosis ( hardening of the blood vessels) and low healthy cholesterol levels. Reducing insulin resistance by addressing the cause of this resistance ( usually due to fat in the muscles) and weight loss can reduce the high cholesterol. This is only the second acquired cause of high cholesterol. A slow increase in the hormone TSH (thyroid stimulating hormone) with a slow rise in the LDL (low-density lipoprotein or LDL) can be tracked over the years. This is because thyroid helps the absorption back of the LDL from the blood into the liver. So when decreased this buy back from the blood into the liver is decreased increasing the cholesterol in the blood. Addressing and treating the thyroid can be a simple reversible cause of high cholesterol. When there is acute stress the adrenaline increases temporarily and this impairs insulin increasing blood sugars and therefore can increase the cholesterol. Unfortunately, we are a chronically stressed, whether it be by our work, family, finances, relationships and so there is a chronic elevation of cortisol another adrenal hormone that comes from a different zone in the adrenal gland. Chronic stress which can increase the cortisol can decrease the thyroid function and increase the insulin resistance that can, in turn, increase your cholesterol. So handling the triggers become a focus of managing health. The liver is the most important organ and maybe that is why it is designed to regenerate. It acts as the border security patrol and helps with processing food and removing unwanted by products via bowels and kidneys by a complex process of detoxification. Fatty liver which is very common. This can also lead to inflammation and increase in the cholesterol. Addressing the cause of inflammation which may be exposed to chemicals, food particularly processed foods and sometimes exposure to the chemical as in hairdressers, painters, and firefighters. Alcohol intake that is chronic (yes despite all what you may have heard about alcohol helping heart disease)can also cause an increase in, particularly triglycerides. 5 steps can you take to help your cholesterol be lowered without taking medications? Get a complete lipoprotein profile that includes your genetic risk. Get your blood tested for hormones, thyroid, and insulin. Identify and manage your stressors. Address lifestyle including alcohol and tobacco use. Get your genetics tested to see if you have the “sticky cholesterol” or Lp(a) protein which can cause an increased risk of heart disease if you do have increased LDL in the blood. Check for inflammation in the blood vessel, gut, and the liver. Once you have been identified to have high cholesterol it is important to address the root cause. High fiber diet mostly plant-based. Reducing over-consumption of saturated fats. Cholesterol in the diet is adjusted by the liver production. Quitting tobacco, moderate alcohol, if the liver is congested or fatty then cutting back on alcohol is important. Reducing the intake of refined sugars with fats. So now can you see why it is not so simple to diagnose or handle? Simply taking medications is never an answer. It is also more complex than simply changing your diet. Quick lowering of cholesterol with a medication, maybe a quick fix till you figure the real problem. Taking medication with no other intervention only leads to long-term complications as the underlying cause, when never addressed will evolve into other chronic diseases. Remember your health requires a 100% partnership with a provider and not a passive shortcut to long-term medications. Check to see if you are truly healthy. I have prepared a checklist to help you identify the testing that needs to be done. Address this with your doctor.